Southbound from Wrightsville Beach, it can be an easy run down the ICW and the Cape Fear River if you have the right wind and tide conditions. On the day we made the trip, it could not have been better. It was anchor up at 0730 in Wrightsville and we were tied to the town dock in Southport at 1045. Light winds and the outgoing tide made for a fast, comfortable trip and as we entered the basin at Southport, it was like seeing an old friend once again. 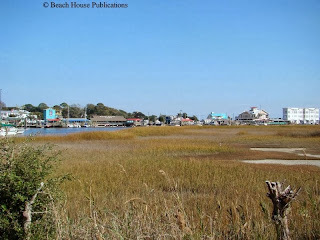 The basin is just off the ICW channel as you make the turn off the Cape Fear River. 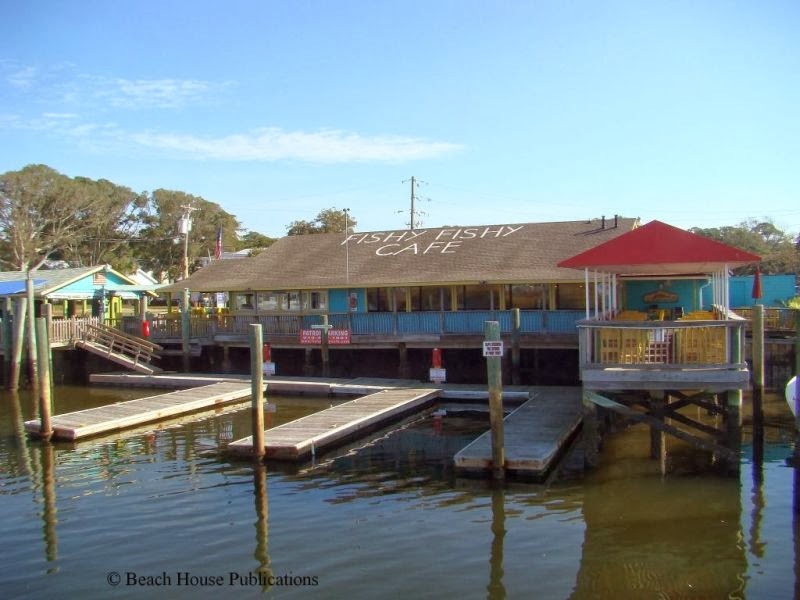 This is a small basin with room to anchor a few boats, and several free docks available at some of the restaurants: The Provisioning Company, Fishy Fishy Cafe and The Yacht Basin Eatery. They allow overnight dockage if you eat at their establishment. There is no power or water at the docks and these are floating docks. The tidal range here is about 5 feet. At the end of a long dock at the west end of the basin is the town dock where you can tie up for free for 48 hours. There is water on the dock and a 20-amp power outlet if you can make it work for the boat. Depths at the town dock can be 4 feet at low tide and with the tidal range, climbing onto the dock at low tide can be a challenge. Boaters do offer to allow others to raft up at the dock and it is much deeper even just a boat width off. 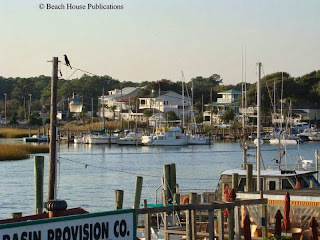 Don't be surprised if you get a visit from Bob and Kay Creech, a very nice couple that lives across the street from the town dock and offers to provide any service you might need. Bob and Kay are Port Captains for MTOA (Marine Trawler Owners Association) and have their boat docked inside the basin. They are very knowledgeable about the area and are also very experienced boaters. 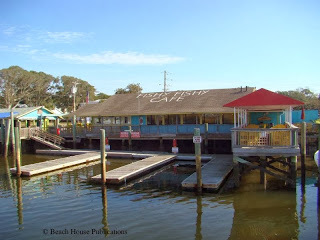 We have eaten at many of the restaurants that surround the basin at one time or another, including the newer Frying Pan, and found them to be excellent. The atmosphere ranges from funky outdoors to the magnificent view at The Frying Pan. The menus are typical fresh seafood, burgers and sandwiches to steak and salad dishes. 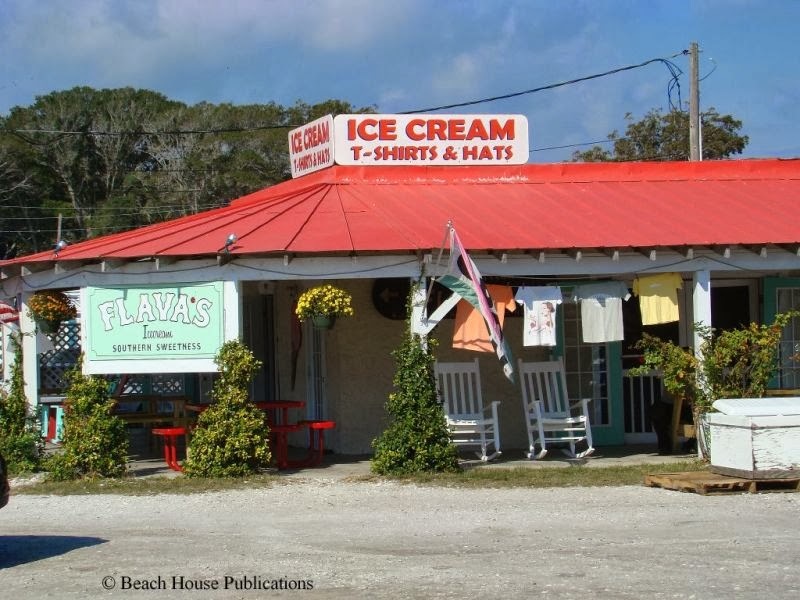 One important establishment is Flava's Ice Cream Shop. We never miss it when we stop here. 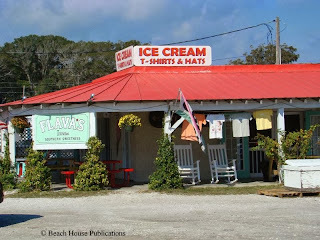 They were, however, about to close for the season on November 1st and had a limited number of flavors. They will open again in the spring. 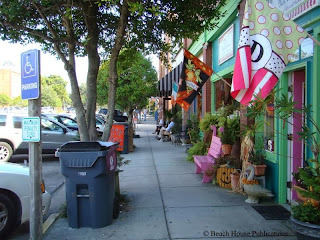 Just a couple of blocks walk from the waterfront is downtown Southport. You will find another typical historic Carolina waterfront community with many shops, restaurants, galleries, antique shops and boutiques. From the town dock or anchorage, walk down Yacht Basin Drive to either Bay or Moore streets, then head east. You may want to make your first stop at the Fort Johnston/Southport Visitors Center to pick up information before you set out on foot to explore. 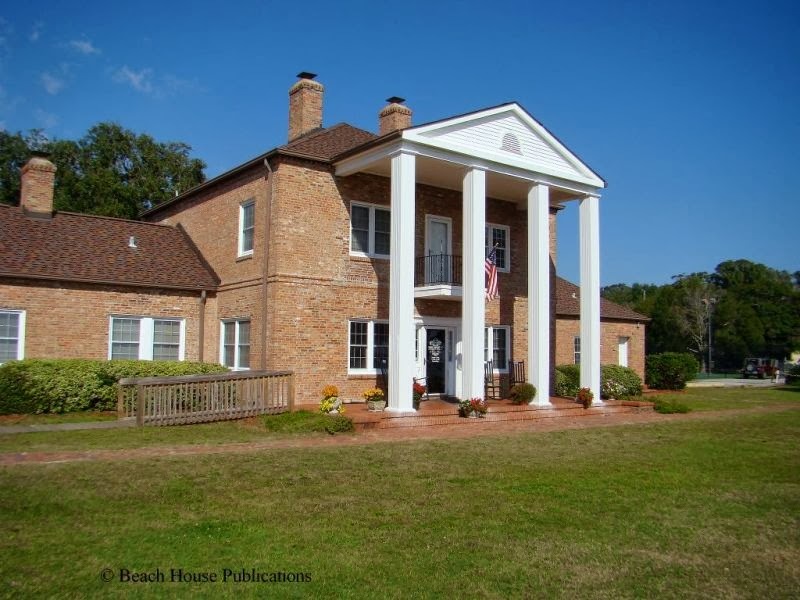 The friendly ladies at the center will assess your needs and provide you with brochures and pamphlets to guide you on your exploration of Southport. The beautiful building that now houses the Visitor's Center, built in 1810, provided living quarters for military officers and belonged to the U.S. Army until 2006. One of the pamphlets provided allows you to take a self-guided tour of historic Southport. The Visitor's Guide points you toward major historic sites and the innumerable shops and restaurants along Howe, Moore and Nash streets. It also lists the many events that occur annually in the seaside village including the Southport Spring Festival held every Easter weekend on the Friday and Saturday before Easter Sunday. Also, the Waterfront Farmers Market is held every Wednesday from 8:00 a.m. to 1:00 p.m (between May and September) on the grounds of the Visitor's Center on the Garrison Lawn at Fort Johnston. Southport holds 3rd Fridays between May and August from 5:00 - 7:00 p.m. with music and food. Stores also stay open during those hours and the atmosphere is quite festive. Other local events include a wooden boat show in late September, tours of historic homes, fishing tournaments and a Christmas boat parade. A recent claim to fame for Southport is being the location for the filming of the popular television series "Under the Dome," based on a Stephen King novel. 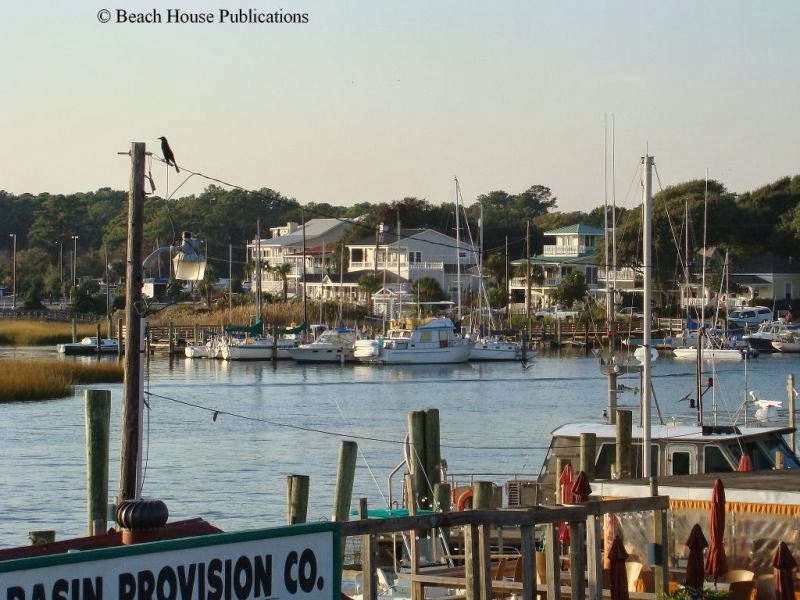 If the anchorage and docks in the basin are full, Southport has a couple of great marinas available. Southport Marina is just to the west of the town basin in their own protected basin. It only takes one a few minutes longer to walk from there to the downtown area. They also have a service yard if you are in need of repairs. A bit farther down the waterway is South Harbour Village Marina, where we have stayed on occasion. We have always been offered a ride to the store or a vehicle to use while there. They also have a couple of eateries on site if you don't feel like cooking. Unfortunately, downtown is not walking distance from South Harbour Village. Other than major provisioning, which will likely require a cab, loaner car or long bike ride, Southport is truly a walking town. We enjoy our visit each time we stop here and have difficulty passing it by.